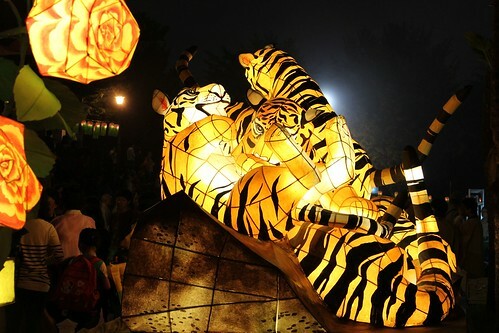 If you ever want to know why I like living in Korea, it's because last Saturday evening at 9pm I was stood in the middle of Yongdusan Park with thousands of other people, immersed in the 2011 Busan Lotus Lantern Festival (there's another in Seoul). By contrast, the only reason you go to a park after dark in my city is to shoot up hard drugs or get murdered. And while there are things to do and places to go after dark, it involves locking yourself in your car and hoping someone doesn’t ram you from behind in one of the bad neighbourhoods which are too numerous to avoid, as part of an insurance fraud or carjacking. 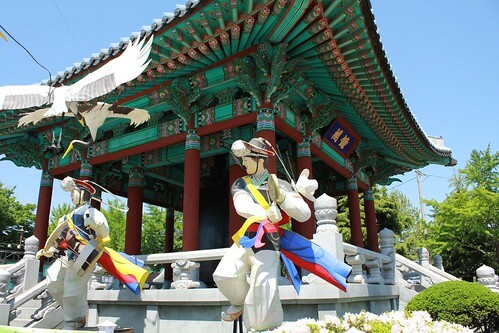 During my first stay in Korea, I saw a lot of places and did a lot of things, and now I have a child I have to reluctantly acknowledge that it was a more carefree lifestyle which might never be fully regained. 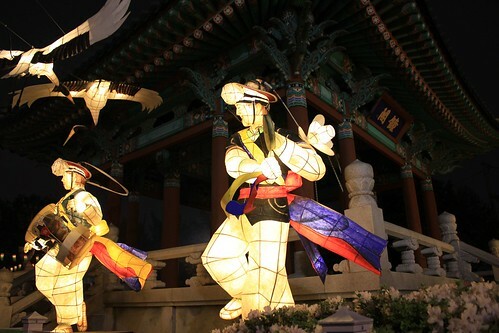 So whereas once we would have made a date to visit Yongdusan Park on Saturday evening for the Busan Lotus Lantern Festival, and culmination of the three-day Joseon Tongsinsa Festival – it was past our son's bedtime and we thought we probably wouldn't make it unless he was in a good mood. But Thursday was Children's Day in Korea, so we went then instead, after lunch. The lanterns were out but the effect was obviously less impressive in the daytime, and we're getting to that time of year where the heat and humidity are becoming uncomfortable, which also detracts a little from the experience. As things were, we actually did manage to get back on Saturday, although it didn't quite work out as planned. The event was scheduled to begin at 8pm, but it was late starting, and we didn't really think through the nature of the event. We went for the lanterns, but there was a parade. Korean parades are often noisy affairs, and when the lights were finally turned on and this one arrived, it was no different. To an extent you can move away from the samulnori and other sundry musicians, but there was no escape from the on-stage performances which were so loud over the speakers I left the park barely able to hear myself speak - this is not an exaggeration. I haven't experienced anything like it since university. Add fireworks into the mix, which admittedly were rather nicely enhanced by the fog, and it explains why my wife - concerned about our baby’s hearing - immediately fled from the park with several other parents. Now our baby is old enough to start seriously venturing from the confines of the apartment, it's occurring to me for the first time that, at least as far as festivals and other events are concerned, Korea may not be particularly baby friendly. Maybe there's a way of holding an event like this without getting noise complaints from Japan, but if there is it hasn't crossed the organisers' minds. Unfortunately at the point at which my wife ran away we were separated, and she had my phone, leaving me with Korean Mother who had taken a seat near the stage and was largely inaccessible – not just because of the language barrier. I spent at least thirty minutes looking for my wife and child, although it could have been longer since without my phone, I didn't know the time either. I discovered why I couldn’t find my immediate family once I worked my way to Korean Mother. "Shall we go?" I asked in Korean, but she said no, she was having fun. I lacked the depth of language to ascertain whether she was saying this for my benefit or not, and I didn't want to press the issue by emphasising that it was really OK to leave, because I was afraid of dragging her away from something she wanted to stay at. Predictably, it later transpired that while she was enjoying the event, she also mainly staying for my benefit. The misunderstandings meant that I saw the events through to their conclusion. 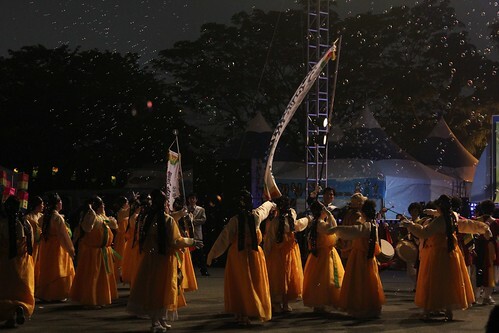 Confusion, noise, colour, laughter, large crowds, barely organised chaos among the performers and the possibility of permanent physical damage afterwards - the Festival was a microcosm of life in Korea, and I wouldn't have it any other way.